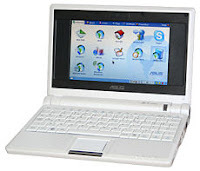 We recently acquired the RM Asus EEE miniBook for £199.00 (+VAT). The miniBook weighs less than a kilogram, starts up from cold in about 12 seconds and shuts down in five. It uses solid state technology and so doesn't come with an internal hard disk or CD drive though the three USB ports enable you to add an external disk drive, if required. It offers 512MB of RAM, 4GB of storage and a seven-inch display; wireless, dial-out modem and ethernet adaptors are available for networking and internet connections, mini-jack sockets for headphones and microphone, a VGA out, an SD card slot and a built-in webcam. It comes preloaded with OpenOffice, iGoogle and Skype to name but a few. The speakers produce good quality sound and, together with the built-in mic, make it very easy to converse with your friends/colleagues through Skype. The miniBook is easily connected to the data projector producing a very clear image. Combine the Asus with the eBeam and you have a very cheap interactive whiteboard.